"DS Wireless" is right on the main menu. Download time is acceptable. The credits are a little long, but not absurd by any measure. Menu options are on a map with sufficient size and sufficient buffer space. Play control is simply a matter of tapping cards and (sometimes) tapping a confirmation. The game will, in certain spots, take double taps too easily, but it's not a major issue anywhere within the game. The graphics are extremely simple (GameBoy Advance almost), but graphics aren't the focus in card-based mini games. The sound is unnecessary: you'll get more from the conversation with the other players. There are no features to choose from. Petz Dogz 2 is a virtual pet simulation. You raise a puppy, take care of it, and interact with it. For an unknown reason, card based mini games were included and the only connection is that pictures od the dogs are on the cards. Now, don't get me wrong: the games are fine (or better). It just doesn't seem to fit the theme. In any case, some of the games were done really well, including Old Maid and Sevens. President, on the other hand, has some serious issues in reules clarification that brings out my biggest complaint: the instructions in the booklet that accompanies the game are mediocre at best and there are NO IN-GAME INSTRUCTION. Games can get extremely frustrating to people when they aren't properly expained, expecially younger audiences. The games are solid and fun (mostly), but a few things need to be tended to. Further integrate the dog theme, allowing for the inclusion of the virtual pet from the single player portion of the game -- and receive reciprocated benefits. 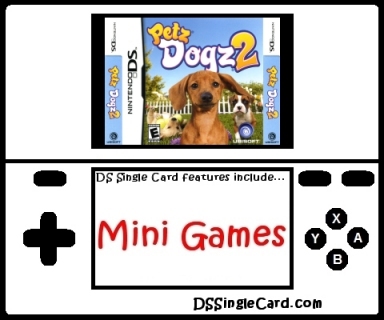 Click here to return to the DSSingleCard.com Petz Dogz 2 profile.